We've had some remarkable Awakin Circle openings in the past month. About a month back, Thuy opened in a very heartfelt way -- which was particularly poignant since the Freely vs. Free reading was by written by her! The week after, Zilong shared an incredibly thoughtful opening for a somewhat deep reading, that led to a very powerful circle. Last week, Shiv opened with his vintage humor, enthusiasm and depth around his grandmother's personality of cherish small things -- on a reading on sincere enthusiasm. :) And this week, Kozo opened with his experience of washing feet of a homeless man, that moved many. Beyond each week's brilliance, there's a subtle kind of diversity that continues to be cultivated over a longer period of time. It goes well beyond the diversity of physical traits, and seems to generate a kind of vibrational resilience through an ecology of thoughts. 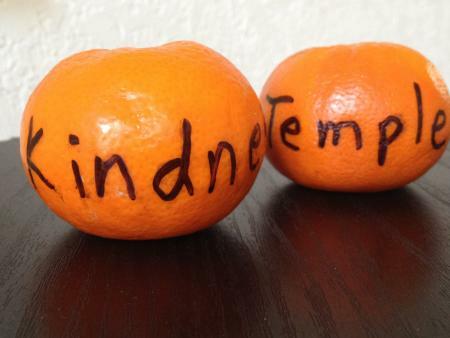 Pancho is in a meditation retreat, but someone made an offering of two poetic oranges yesterday, that had a phrase he frequently uses: Kindness Temple. Any place where someone can offer anonymous oranges with such love has no choice but to be sacred.